This post first appeared on Feb 16 with details of how to order the work from NHBS at £399. I was promptly contacted by Georg Muller the author to tell me that neither he nor his publisher had supplied NHBS and certainly not at this price. If you would like to purchase the book please contact Georg Muller direct for 318 euros = 262 pounds including shipping costs if it is dirket ordered from the author. See website http://www.wallhecke.de. This is an impressive work that Georg has funded himself. Without visionary and dedicated people like him, works like this would not exist. Worth every penny. 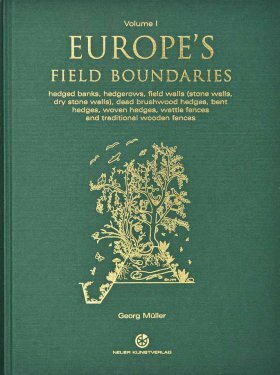 After 30 years of intense research in over 30 European countries Georg Muller has produced a colossal and comprehensive new work on Field Boundaries across Europe, which highlights the connection between farming methods and their field boundaries. If you are feeling charitable and should you wish to purchase a copy for me, well, my gratitude would be as large as Georg Muller’s work.